BCF : Pope Francis urges Moroccan Christians against converting the Infidels in Morocco. “Please, no proselytism!” he told an audience of around 400, who greeted the pope’s arrival by ululating and applauding, while hundreds more gathered outside the cathedral. 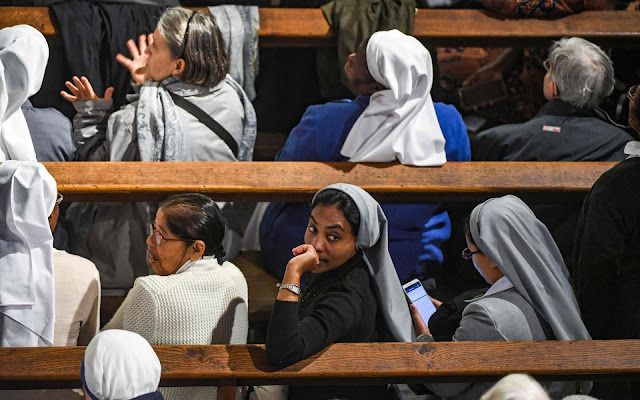 Christians are a tiny minority in Morocco where 99 percent of the population is Muslim, with sub-Saharan Africans making up a large part of the country’s 30,000-strong Catholic community. Islam is the state religion and authorities are keen to stress the country’s “religious tolerance” which allows Christians and Jews to worship freely. But Moroccans are automatically considered Muslim if they are not born into the Jewish community, apostasy is socially frowned upon, and proselytising is criminalised. Our Pope is a a Dhimmi of the highest magnitude !!! What does the Bible say about spreading the word? He goes against the teachings of Christ, this Commie!! Matthew 24:10-20 : And then many will fall away and betray one another and hate one another. And many false prophets will arise and lead many astray. And because lawlessness will be increased, the love of many will grow cold. But the one who endures to the end will be saved. And this gospel of the kingdom will be proclaimed throughout the whole world as a testimony to all nations, and then the end will come. Mark 16:15-16 : And he said to them, “Go into all the world and proclaim the gospel to the whole creation. Whoever believes and is baptized will be saved, but whoever does not believe will be condemned. Matthew 28:19 : Go therefore and make disciples of all nations, baptizing them in the name of the Father and of the Son and of the Holy Spirit. Then they will hand you over to persecution, and they will kill you. You will be hated by all nations because of my name. And then many will be led into sin; they will betray and hate one another. Many false prophets will arise and deceive many; False messiahs and false prophets will arise, and they will perform signs and wonders so great as to deceive, if that were possible, even the elect. Behold, I have told it to you beforehand. So if they say to you, ‘He is in the desert,’ do not go out there; if they say, ‘He is in the inner rooms,’ do not believe it.